All these startups in my feeds lately are killing me! There are tons of them, but none seem to be doing anything particularly special. I mean, it's nice that there's a sort of rebirth of small startups, but there's absolutely no sort of wow factor that I've seen. And no, this isn't an anti-Web 2.0 style backlash: I really believe in the idea of the web as a platform. Amazon and eBay's web services are perfect examples of platforms which have created huge value for both companies, as well as the developers using their APIs. That's not the problem. It's all these Flickr-wannabes, flip-it-quick companies that are bugging me. Scrape Engines - These are the little search sites focusing on one niche or another. They're not full-on Search Engines that crawl the entire web and add value by allowing us all to make order from the massive chaos that is the web, they rob value from other sites by crawling them to death and stealing most of the vital information, returning very little. I'm sure there's some sort of justifiable symbioses here for some, but most are just leaches, IMHO. Mashed Ups - Yes, it's so neat you can add a free map to your database of geo-data. Good for you. Thank Google for giving god-knows-how-much money to Navteq for you every time you query their data and render a map. Even the GOOG can only throw so much money out the window for so long, so I wouldn't plan on that lasting very long. If you're doing the Mash-up for fun, that's cool. But be honest, you're not really creating much value are you? Yes, sometimes the sum of parts can be greater than the whole, but that's really not the case here. Web Trapps - AJAXy, Tagged and Shared: Calendaring, To Do Lists, Email, Notes, Word Processors, Project Management, Databases, and anything to do with Getting Things Done. Have fun with all that, but 99.9% of the people out there will still be using Microsoft Office and Yahoo! (Yes, my employer, but I'd say that anyways.) Really. Look, I don't *trust* your site to keep my personal (and definitely not my professional) data safe, okay, and I'm not going to change my daily habits to include a site that may disappear from the face of the Earth tomorrow. And I could participate in the whole collective intelligence part, but then I'll just abandon you if you "go commercial" then as well. Social Anything - Look, you're not going to be another del.icio.us alright? And News Corp is the last company to ever pay that much money for a Social Networking site. Ever. (Yes, that includes you too, FaceBook). And you know how I'll find that podcast, song, movie or other digital content I'm looking for? I'll probably just ask a friend, search for a reviews, browse iTunes, or buy whatever is marketed at me like everyone else. Phile Sharing - Oh my god! Stop with the photo sharing sites already! An honestly, if you describe your site like, "It's like Flickr, but with [insert file type here]" then you've got serious problems. No, really. No, no, really. Content Management Saturation - There shall only be one Wikipedia, and it's free. There's about as many blog and wiki software platforms as there needs to be. Generally, I think at this point, the world does not need another CMS solution. Maybe in a few years, but right now we really have what we need. RSS Holes - RSS is a pretty great technology, but really, how many more startups munging RSS feeds do we need? Google and Yahoo! are already doing RSS Search, so there's probably better ways to spend your efforts on that front. And if your service is described like, "We take the RSS feeds and do [insert cool sounding agent/filtering/analysis technology here]" you're in trouble. Yet, though Bloglines has barely touched their feature set in over a year, no one seems to be able to come up with a decent competitor in terms of functionality and usefulness (and ability to read via mobile) - that I don't get. Firefoxing - Umm, I like FireFox as much as the next geek. But if you're creating enhancements to a browser with a 7% marketshare, god knows what you or your investors are thinking. Am I missing anything? Any general category or buzzword I left out? My general problem is not really with the effort involved in the above types of apps and companies, I'm sure they're all working hard as hell in their own way. It's just both the innovation and the ambition of this stuff is so lacking. They all seem to be aiming at the quick hit. The simple win. Someone said to me today, most of these sites are just sort of features not actual services, and it's true. It's so depressing. It just seems that no one is trying to change the world any more. No one is aiming to create "insanely great" products or do the impossible. Why not? Why are so many people grasping at the low-hanging fruit, when there's so much more goodness for everyone if they just stretched a little higher? That's just on the product functionality side - I haven't seen anything interesting on the business side either. No one seems to be coming up with the next interesting new business model. I'm not looking for anything wacky, but there's got to be better ways for your site to make money than waiting for Google to send you an AdSense check every month. Seriously, everyone seems to think the Text Ad Train is just going to keep on rolling forever. It's not. Where is the new innovation to keep things moving? Remember, Google stumbled upon the way to do it right, but someone came up with the Contextual Advertising concept first and his name was Bill Gross. Where is that type of new innovator? Actually, where are all the personalities, period? Where is the hubris of Jobs? Where is the unrelenting focus of Gates? Where is the arrogance of Ellison? Come on, let's get some new budding tech-industry stars out there! I want to see someone's face on the cover of freakin' Time soon, you know? It's been at least a year since Larry and Sergey... Come on! Who's next? And finally, where is the goddamn mobility? This is what most depresses me most about these new sites. Not being able to use my mobile to sign up and use any new site or service that's launched now is completely inexcusable. I don't care what you're doing, you're wasting your time and the 20 seconds I spent even checking out your site. The future is so obviously in mobiles, why the hell are so many startups still screwing around on the desktop? Morons. What I hope is that this all just a phase - sort of an echo of The Bubble, not indicitive of the cool new stuff that's coming this time around. Soon we'll see hundreds of innovative new tech startups bloom, focusing on new platforms, trying to *actually change the world*, not just be lucky and get bought out by a big fish. I mean, hey, not that there's anything wrong with that - I'd love to have Jason Calacanis' bank account right now. But there's just so much more, you know? Anyone know of a startup like that? What are they doing? Are they going to change the world? Quick Update: I changed the heading of one of the categories, I was starting in one direction about user generated content, but then went off into another direction and didn't go back to change the title. 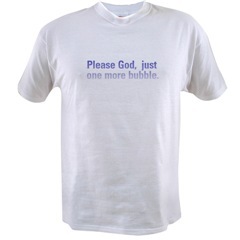 Also (very important) the T-Shirt above is via Blogoscoped, and you can get it at their CafePress Shop.